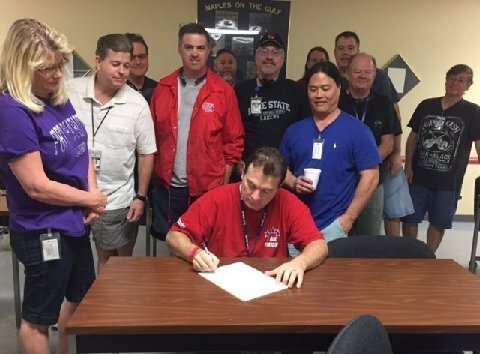 This morning the Southwest Florida Area Local – American Postal Workers Union signed a $5.2 million settlement from the 2013 Arbitrator Hales award (Fort Myers P&DC). The award sustained the SWFAL-APWU’s position that the USPS took Flats Preparation work away from the Clerk Craft in August 2000 and gave the work to the Mail Handlers. This award stated the parties must go to the Article 15 process and come up with a monetary remedy. A special Thank You goes out to National Business Agent Billy Woods who did a fantastic job in representing our local in this case.After Arbitrator Hales award came out, it was apparent that management did not agree with the decision, nor did they have any intention on settling this case. After having no success and little help from the National APWU Lawyers, the SWFAL-APWU decided to hire their own attorney’s to represent the local. Thanks to APWU President Mark Dimondstein and Industrial Relations Director Tony McKinnon on working with the SWFAL-APWU and allowing our local to go through the judicial & negotiating process with little interference. With President Dimondstein’s approval, the local hired “MaseLara”, a law firm based in Miami, Fl with Richard Lara being our lead attorney. MaseLara took the USPS to Federal Court and the SWFAL-APWU received a decision that forced the USPS to go back to the bargaining table. At that point SWFAL-APWU Vice President Dan Gray, Clerk Craft Director Paul McAvoy and I began the year long process of negotiating a settlement. I hope that our local’s fight will help encourage other locals to stand up when they win arbitration cases. Sometimes you have to be prepared to do what is necessary to win. I thank my membership for standing behind our Executive Boards decisions and waiting patiently as many people (including some in the APWU) said this day would never come. I’m proud that we were able to prove them wrong. Now that we have success with the August 2000 thru June 2006 portion of Arbitrator Hales Award, we now have to pursue the return of our work back along and an additional monetary back pay from 2006 until the resolution of the Article 15 process. Although a $5.2 million settlement may sound great, the SWFAL-APWU will continue to fight on until we get our work back and our membership is made entirely whole. This entry was posted in Clerk Business, General Union Business and tagged arbitration Award, Arbitrator Hales, Clerk work, Dan Gray, Federal Court, Flats Preparation work, MaseLara, Paul McAvoy, RI-399, Richard Lara, Sam Wood, settlements, Southwest Florida Area Local. Bookmark the permalink. ← Do Level 8 Auto Mechanics work on diesel trucks? This is the worst part of the whole story. After having no success and little help from the National APWU Lawyers, the SWFAL-APWU decided to hire their own attorney’s to represent the local. Congratulations! Thinking outside the box is clearly a needed trend for unions.